Photographing the Milky Way is one item on many a photographers 'must do' list. Why? It's a sight rarely seen with the naked eye thanks to light pollution. With the right technique even our basic DSLR cameras can capture the faintest Milky Way. You'll need a DSLR camera with a wide angle lens, and a tripod. Get away from the city to a dark are between February and September. Set a wide aperture and a high ISO starting at 3200 or higher. Use the 500 rule to set a long exposure. What equipment do I need to photograph the Milky Way? Where can I see the Milky Way? From a busy city location light pollution overpowers the weaker star light blotting out all but the brightest of stars. In heavily light polluted areas the light from the street lamps will fill the atmosphere, washing out the photo. The solution is to get away from the cities. Go to a dark sky site to the north of a less populated area. 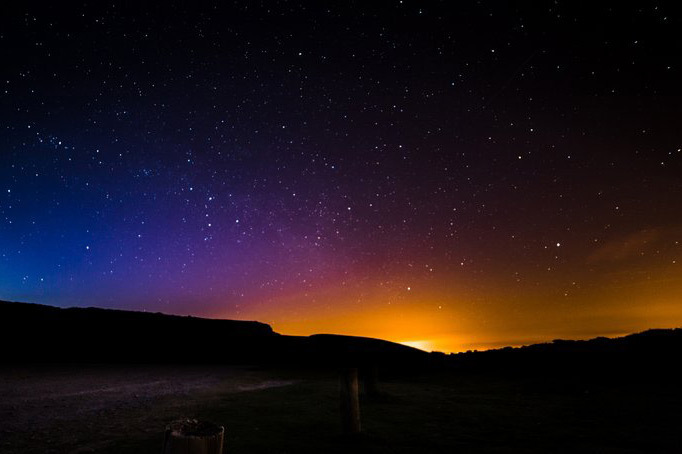 This excellent resource lists all approved UK dark sky sites: http://www.darkskydiscovery.org.uk/dark-sky-discovery-sites/map.html. Light pollution from near by cities can make it very difficult to photograph the milky way. What is the best time to observe the Milky Way? The Milky Way isn't visible to the naked eye all year round. The brightest part of the Milky Way is best seen from February to September on clear nights. The core will rise in the southern half of the sky, to the south west. The more northerly your location, the lower the core will remain in the sky, and the further east it will rise. It takes about 15 to 20 minutes for your eyes to adjust to darkness before you will see the Milky Way clearly. Avoid all light sources and use the brighter stars of Sagittarius to help you pick your shot. Alternatively you could use an app to locate your stars and the galactic core. Stellarium tells you where, and when to catch each of the sky’s features which can be very helpful when setting up in advance. Note: The further north the viewing position, the lower the galactic core will rise from the horizon. Further north than 65 degrees latitude and you’ll be out of luck for the Milky Way, but more likely to catch the Aurora Borealis (Northern Lights). 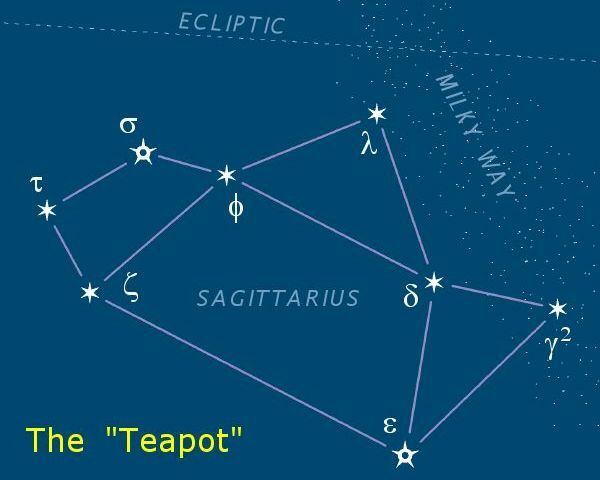 The core of the milky way can be easily identified by first locating Sagittarius or 'the teapot'. Whenever possible arrive at your location before dark. With some planning you should know roughly where to aim your camera and at what time your shot will come into view. Use the daylight to choose an interesting location with some foreground features to add interest to your photograph. Setting up the camera on a sturdy tripod with remote trigger (cable) during daylight will ensure a quality night sky photograph. Once night falls this task becomes much more difficult. How can I avoid camera shake when photographing the Milky Way? Ensure that have a stable setup with a well placed tripod and that your camera is securely attached to the mount. Any movement or ‘creep’ due to a loose attachment or too much weight on the mount will ruin your shot. Attach a remote trigger or shutter release. This will enable you to trigger the camera without risking any camera shake, or accidentally adjusting any settings. Alternatively, the self timer mode on your camera will allow the camera to settle down after pressing the shutter. How do I focus on infinity? Use a very distant object to focus on infinity. Often the infinity marking on the lens will not be one hundred percent accurate. Switch off auto-focus and using live-view focus on something far away. Next, use your camera's live-view zoom to see more detail and further refine your focus. Take some test shots and adjust if required. Leave auto focus turned off and note the position of the focus and zoom rings on your lens. This will ensure your focus stays sharp. Turn off image stabilisation when on a tripod for a sharper image. What exposure settings do I need to photograph the Milky Way? Using a long exposure time will allow the camera to gather enough light from even the faintest of stars. Since the Earth is spinning, if the exposure is too long the stars will appear to move across the sky. To keep the stars sharp and point-like with the longest exposure possible we can use the 500 rule. This is a rule created for full-frame professional cameras or 35 mm film. I’ve also included a modified version of the rule for entry level to mid range crop sensor cameras. What is the 500 rule? Example: 500 / 14 mm = 35 Seconds. It's easy to see why a wide angle lens with a low focal length is perfect for Milky Way photography. Photos taken at longer focal lengths require shorter exposures to stay sharp and capture less light and detail. What aperture should I use to photograph the Milky Way? The goal of Milky Way photography is to capture as much light as possible in the limited time available. The wider the aperture of your lens the more light your camera will capture. Setting your aperture wide (with a low f number) will help. Set the widest aperture possible without losing image sharpness. For more info on aperture read the exposure guide. A high ISO will allow the camera to make the most of the limited light available, but at very high ISOs cause detail loss as the quality of the image is decreases. Start at 3200 and take photos at increasing ISO values. How do I get the best Milky Way exposure? Judging exposure one of the biggest challenges in Milky Way photography. The image on the camera screen is pre-processed and misleading. To judge the quality of your exposure you will need to use the camera’s histogram. While previewing a photograph, your camera can display a histogram; a graph displaying the distribution of light in the photograph. Viewing the histogram, you should see peaks on the graph, if the majority of the peaks are on the left this means your image is mostly dark, and to the right means mostly bright. Seeing peaks all the way to one side or the other usually means you’ve under or over exposed the image. This is called clipping. There is usually some tolerance for clipping, especially if you're shooting in RAW, however it’s good practice keep all of your peaks within the bounds of the graph. The histogram is a graphical representation of the brightness of each pixel. In this histogram there are far more midtone pixels than shadows and highlights. ‘Expose to the right’ (ETTR) is a method commonly used by astrophotographers. ETTR means exposing an image to have most of the peaks as far to the right side of the histogram as possible without clipping. You can learn more about ETTR here: https://en.wikipedia.org/wiki/Exposing_to_the_right. Why do we use ETTR when photographing the Milky Way? In astrophotography the majority of the image will be dark. By using the ETTR method it is certain that we have captured the maximum amount of light and detail possible. Later we can manipulate the image to bring out the range of brightness required without detail loss. The noise created by using a high ISO can be partially avoided as noise mostly manifests where the camera captured too little light. By giving ourselves headroom to dial down the exposure we’re effectively reducing signal noise instead of amplifying it. At the same time, we’re allowing our camera time to capture even the dimmest of stars. Expose to the right (ETTR): With most of the images pixels in the highlights, the peaks on the graph are on the right. Editing is an essential step to bring out the detail in the Milky Way. You'll need a capable photo editing application such as Adobe Photoshop or Lightroom, Affinity, or Aperture. The following instructions are based on my workflow in Lightroom, however they are easily transferable to other applications. Don’t be put off by the raw file. Depending on the levels of light pollution and clarity of the sky at the time of shooting your photo may appear washed out and lacking in contrast and detail. More so if you used ETTR. Raw files need some work to bring out the layers of details. It’s easy to get carried away, and when doing large adjustments some of the finer details can be lost. Treat your edit like a delicate balancing act of bringing out the fainter stars without loosing the subtle detail. Raw Milky Way images will often look very dull and without contrast - this was shot using expose to the right (ETTR) as described above in less than ideal conditions, during a very short window between sunset and moon rise. Raise the exposure until the maximum amount of detail is visible and no more. Once you’re no longer seeing more start appearing (not to be confused with the noise) stop raising the exposure. If you used the ETTR method lower the exposure until you start to see details disappearing, then back up a little bit. This won’t remove the washed out look if you had a light polluted sky, further adjustments will be needed. Adjust the exposure on your Milky Way raw photo until you can see as much detail as possible. Adjust the contrast using the curves editor to darken the deepest shadows without losing the detail in the brighter areas. Making small adjustments adjust the curve for the desired result. The sky is rarely pure black, so try to remain true with your initial adjustments. For further detail enhancement, adjust the clarity or detail enhancement controls. Adjust the tonal curves to enhance contrast. Once you’ve revealed the best of the details edit the photo as normal. Use a natural white balance if you wish to keep the true details aim for a white balance setting of around 4600 and adjust to taste from there. Using the colour adjustment sliders orange light pollution can be reduced, and the natural blues can be enhanced. Apply noise reduction very lightly. Heavy reduction can remove stars from your photograph. Although Lightroom’s noise reduction has improved in recent releases, tools such as Topaz, and DXO Optics Pro offer the best results. Adjust noise with care. In some extreme cases multiple subtle passes of noise reduction are required meaning applying small amounts then going over the image again until the noise is dealt with. Hot pixels are bright over saturated pixels in your image caused by the heating of your camera sensor over long exposures. They occur more in warmer environments but can happen on any long exposure. To perform a dark frame subtraction you’ll need to put the lens cap back on immediately after taking your photo. Next shoot a dark frame of equal length to your main photo. By doing this under the exact same conditions as your Milky Way shot the noise produced by your camera can be recorded. This noise can removed in Photoshop. Note: Dark frame subtraction should be done before any additional editing.